With summer fast approaching, it’s time to take a look at Swimwear Trends in 2013! 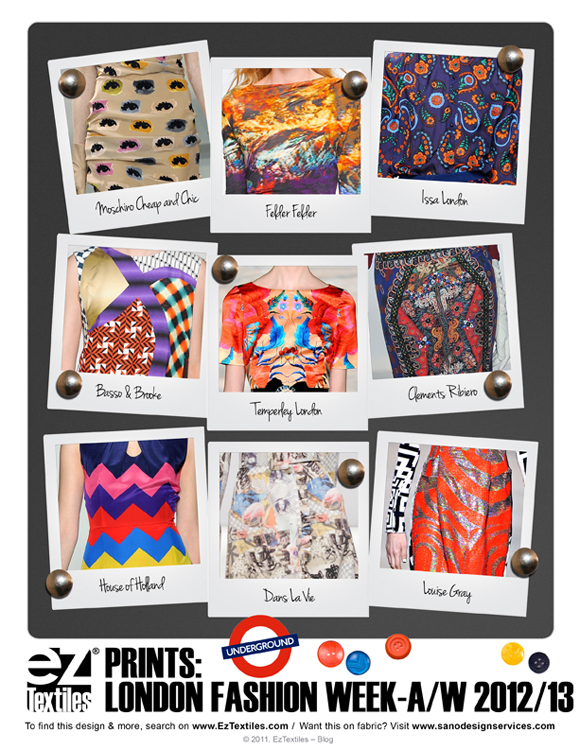 Retro styles with funky prints caught our eye here at EzTextiles! We especially appreciate the florals and geometrics found below, and hope you hop on over to our SWIM 2013 Collection to see similar prints! Build a collection of prints, and for as little as $1 a download, you can mix and match a collection to your hearts content! Fun printed swimwear trending now for 2013! The Burkman Bros just launched their capsule collection The Tourist with Urban Outfitters and we were there for the launch party! 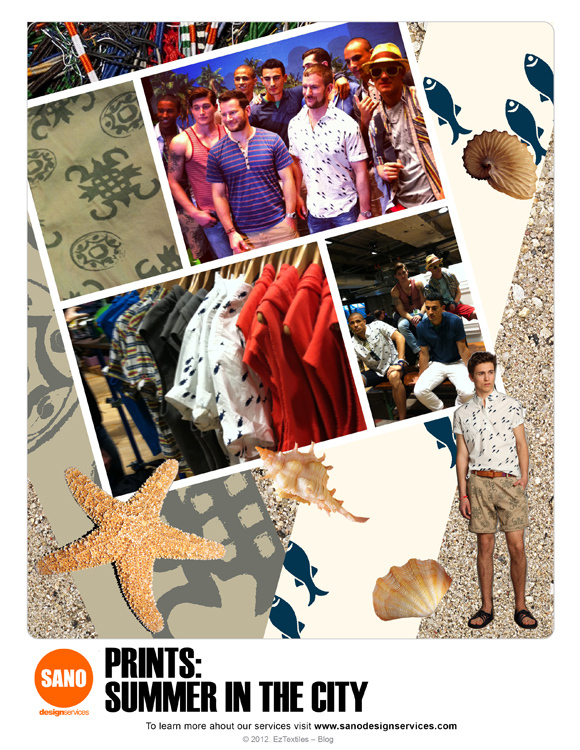 Our sister company, Sano Design Services, got to help out the brothers with their print design for their collection. Sano Design Services is a CAD service bureau that is based in New York City. They have many helpful services, and not just print development! Sano Design Services also creates graphics, illustrations, tech packs, product visualization, and produces digitally printed yardage. Also, their team can assist in trend direction, branding, merchandising, and consultation. Look out for more blog posts from the Sano team, and check them out! 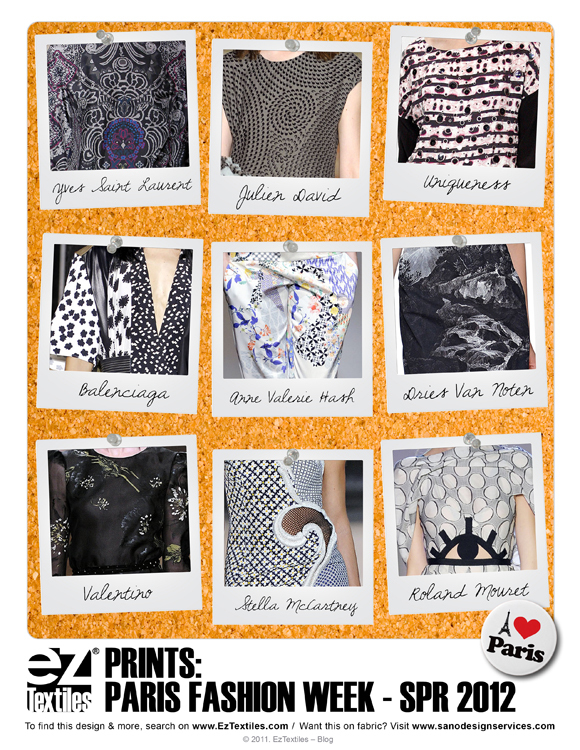 Closing out the month of fashion frenzy, Paris never ceases to disappoint! We were baffled by the eclectic mix of surrealism, dreamy impressionistic watercolors, eastern & western art and classic florals. The wide array of ideas allows people of all tastes to find a collection to dazzle the senses. We can’t put our finger on just one overall theme, which allows us the freedom to let our design aesthetic wander to the unknown. 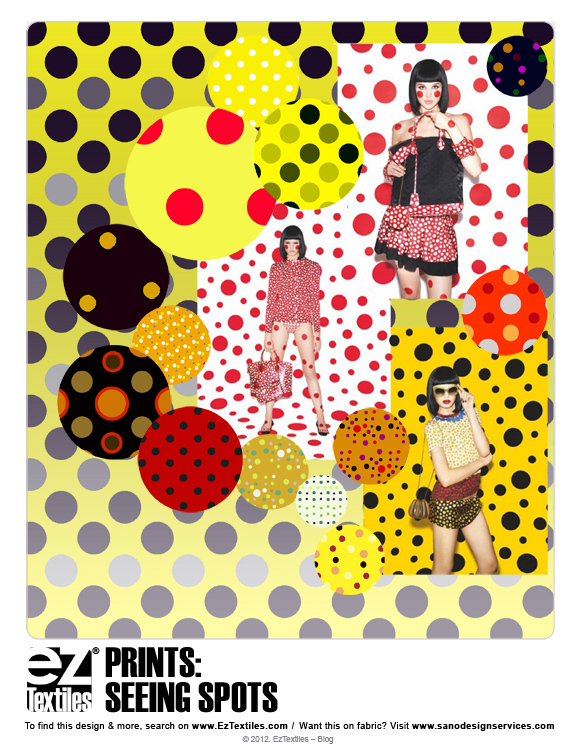 Try your hand at pairing unconventional prints with classic designs such as a foulard or polka dots! Why not create a collection of your own on EzTextiles and see where your imagination takes you! Don’t forget that our search function has many layers, so once you choose a search option in the drop down menu on the left, additional sub-menus appear to further deepen your search! 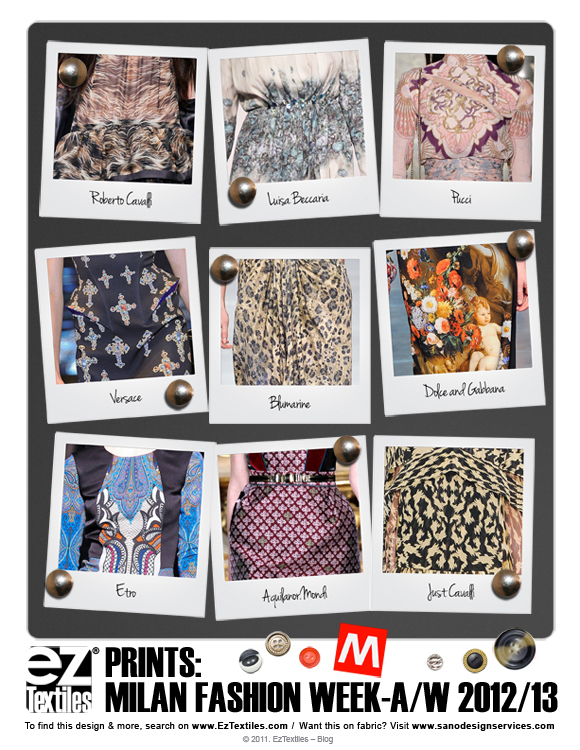 Prints were front and center in Milan during the Italian Fashion Week! Juxtaposed to London’s exploration of brights, in Milan we saw muted tones that gave an overall darker sensibility. 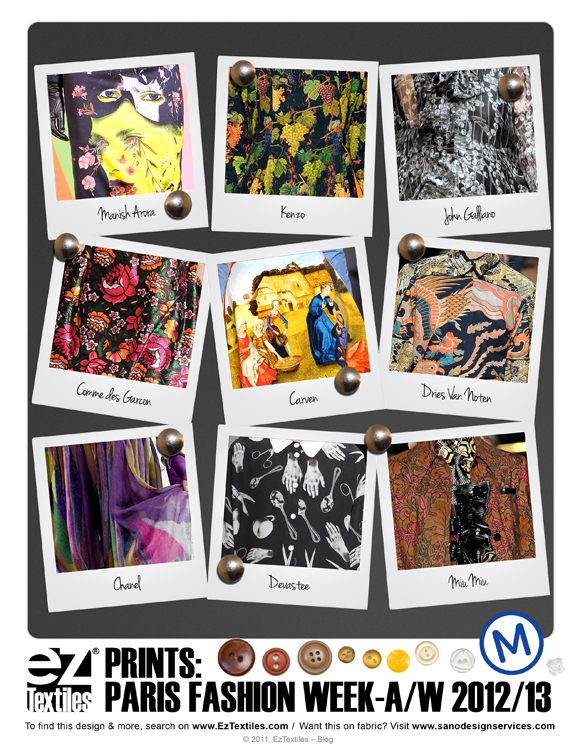 We also noted photographs & artwork translated directly onto fabrics, and new twists on classic animal prints. 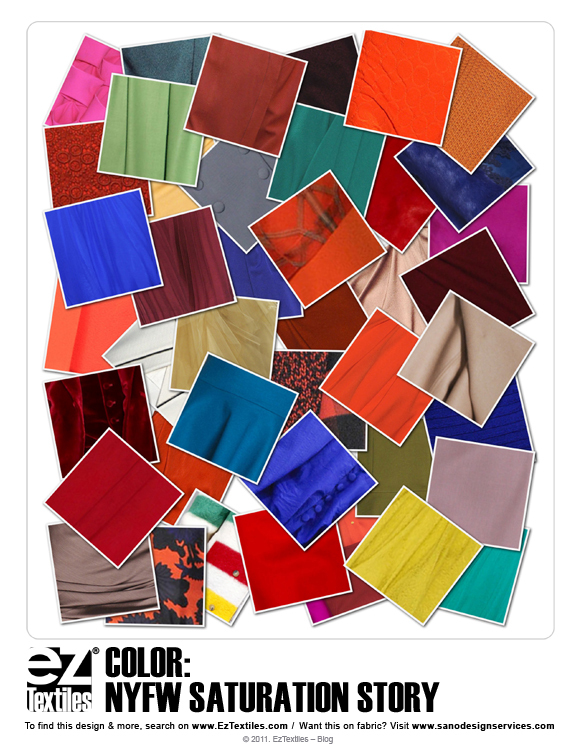 Click the image below to explore all of Milan Fashion week, and get started making a new collection on EzTextiles.com! We’ve got animal prints, geometrics, and florals to give you a jump-start, all of which are fully editable so you can easily download your designs and recolor them with your unique color palette! We love seeing new trends emerge so we had to spotlight Antoni & Alison, two designers from London who made their way back to the catwalk this year, after an almost 7 year hiatus. 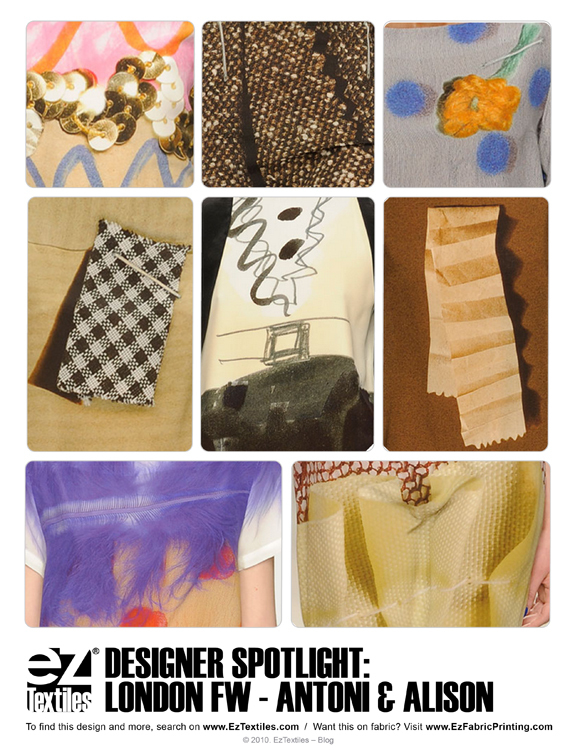 Pairing shift dress silhouettes with striking trompe l’oeil silk screened fabrics, we saw a surreal and fresh attitude we hope sparks new motivation in designers around the world! Did you know that our parent company, Sano Design Services, offers digital printing on over 80 fabrications? Why not let the images below spark your creativity and start coming up with your own magnified textures! Simply bring us your designs and get an 8×10″ test print out for only $8! Don’t let this trend pass you by! Take advantage of our fabric printing services and start adding these funky textures to your products today! The Fashion World may have moved on to London but we have to highlight the colors we saw coming down the runway this past New York Fashion week! It was great to see the radiant palette, with an abundance of fiery oranges and a broad spectrum of blues! After getting a glimpse, we had to check out EzTextiles and use the “Lock Color” function to see what we could find using the below image as inspiration! Click here to check out how you can easily find these Fall colors in our Library today! It’s nearing the close of New York Fashion Week, for the Autumn/Winter 2012/2013 season! 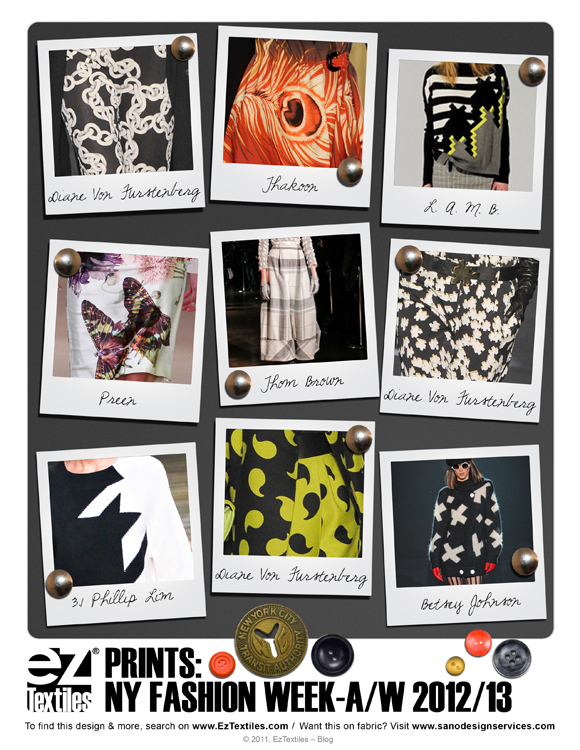 We’ve had our eye on all the prints that have been walking down the runways. From fabrics that appear to be moving works of art to faux textures and photographic images, the trend seems to be overwhelmingly large scale! That certainly gets our wheels turning, since it’s easy to start visualizing our ENTIRE 25 Million+ images in extra large scale! Below you’ll see some designs that are blown out of proportion for a fresh new feel! After checking them out, why not get started designing your own?